Ashley Beteta was always interested in Korean culture. In high school, she started a Korean culture club. She would research facts about Korea and present them to her classmates at weekly meetings. When she came to UCLA, she decided to study political science with a concentration in international relations. However, the major and focus was not enough, so she searched for a Korean cultural club. Now as a second-year student, Beteta is the historian for Hanoolim – UCLA’s only Korean cultural organization dedicated to spreading cultural awareness. Hanoolim, established in 1990, was originally a political organization aimed to raise awareness to Korean immigration and discrimination issues. 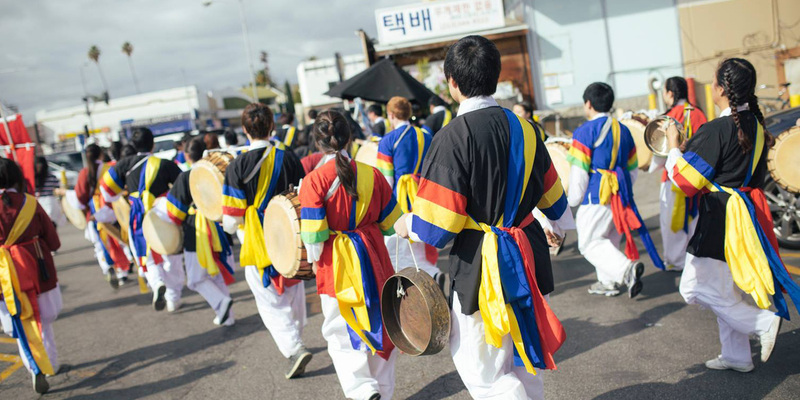 Through poongmul, or traditional Korean drumming, the student-run organization participated in demonstrations and protests, standing at the battlefront especially when the Los Angeles riots struck Koreatown in 1992. 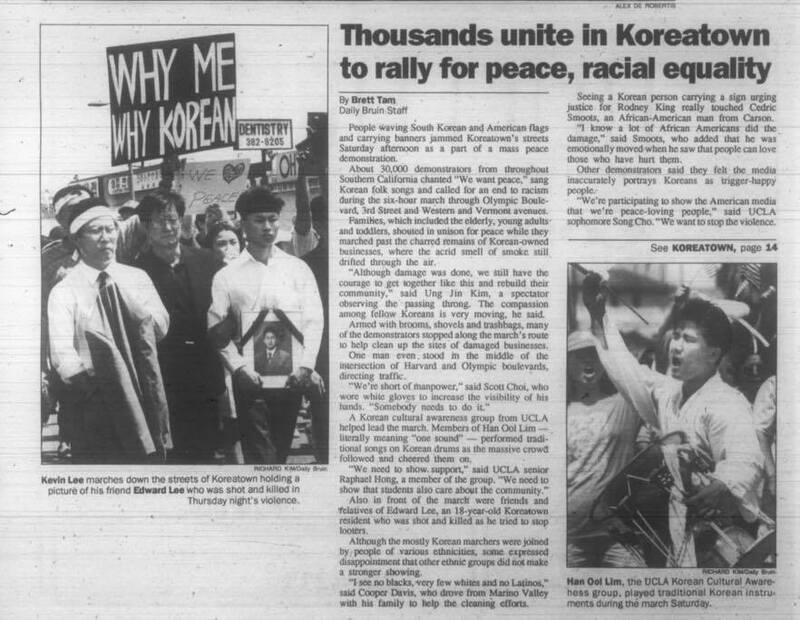 The student group helped lead a march through Koreatown during the riots, performing poongmul while the crowd followed and cheered on, according to a 1992 Daily Bruin article. Photo courtesy of Hanoolim KCAG. “We need to show support. We need to show that students care about the community,” said Raphael Hong, a member of Hanoolim then, in the article. After 24 years, though much less politically oriented, Hanoolim still maintains close ties with its community. Every year Hanoolim participates in the annual Koreatown Ji Shin Balp Ki (JSBK), a Lunar New Year tradition to remove evil spirits and to bring good luck to residences and stores. The poongmul team, along with UCI’s and USC’s, would go from door to door and perform the traditional Korean art. The experience is “just amazing. Lot of older adults (are) so touched by the sight of us playing and that young people are celebrating traditional Korean holidays,” recalled Sally Oh, external vice president of Hanoolim and a third-year student, when she led the poongmul team at JSBK last year. Besides serving its community, Hanoolim also shares the arts and traditions of Korea to the UCLA community. 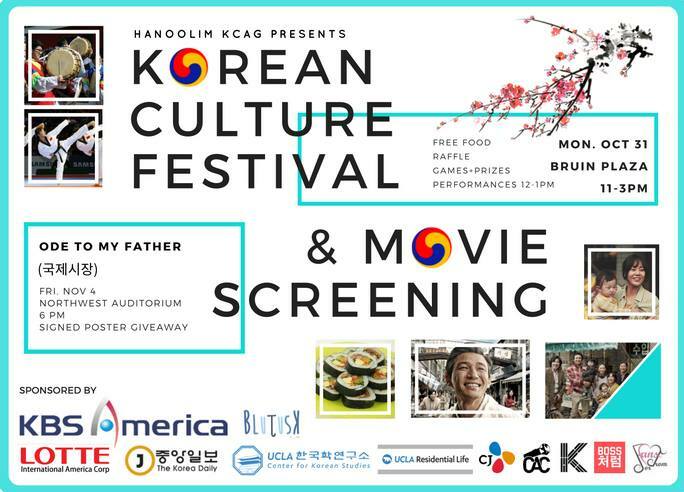 Just recently, Hanoolim hosted its annual Korean Culture Festival at Bruin Plaza, showcasing Korean food and hanbok, a traditional festive attire, to name a few. First-year student and Hanoolim member Minsoo Kim said when the festival was nearing its conclusion, a woman asked him the names of all the Korean food that was served so the next time she was at a Korean restaurant, she would know what to order. “People seemed pretty excited to go and play” the traditional games, added Kim. Near the end of the academic year, Hanoolim additionally hosts the annual Korean Culture Night, a collaborative event that emphasizes the arts and dances of Korea. One particular art emphasized is none other than poongmul. “Poongmul is very tied to our traditional culture. It was the music used by the more common people back in history,” described Hyeri Choi, a fourth-year student and current lead poongmul coordinator. And just like the commoners in ancient Korea, the lead coordinators upheld the oral nature of the art, passing the music down to new members verbally. There is neither script nor sheet music for reference. “This is the way it’s done, the only way it could be done,” said Choi. Despite it being a hundreds-year-old art, other members of the poongmul team find no contention with the practice. “I do appreciate how there is an effort to keep the tradition alive,” said Kim who is also a member of the team. Whether it be because of the traditional drumming, community outreach or people, Hanoolim truly establishes itself as a cultural group and a community. “Hanoolim gives you a lot of opportunities to be not only a part of the Korean community but also the UCLA community. (You can) be part of something bigger, get opportunities to either perform or run (a) show,” mentioned Oh. “It really (is an) incredibly inclusive and welcoming community,” noted Choi.